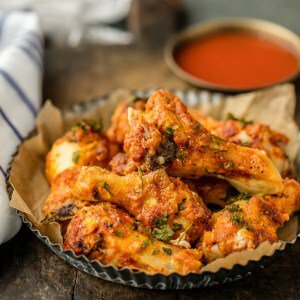 This Baked Chicken Wings Recipe was originally published in February 2016. Baked Chicken Wings have the most amazing Chicken Wing Seasoning consisting of paprika, garlic, salt and pepper. If you’ve wondered How to Bake Chicken Wings that are crispy, flavorful, and amazing, this recipe is for you! EASY Baked Chicken Wings do exist and they’re just as delicious, and definitely healthier, when baked and not fried. This is our very favorite Baked Chicken Wings Recipe! This Baked Chicken Wings Recipe is so easy and delicious! And we’re making it with the BEST Chicken Wing Seasoning. I decided to make these Baked Chicken Wings for Pat for VDay. I have been thinking a lot about Valentine’s Day recipes lately. All my planning notes consist of pink this and pink that. But if I really want to fill my husband’s heart and stomach with love on February 14th, there’s only one way. CHICKEN WINGS! I’ve been experimenting with easy hot wing recipes lately, and I think I’ve found a favorite. I love that this Baked Chicken Wings Recipe is healthier than traditional chicken wings because it’s baked and not fried. We already know we love Oven Fried Chicken, so I thought it would be perfect. 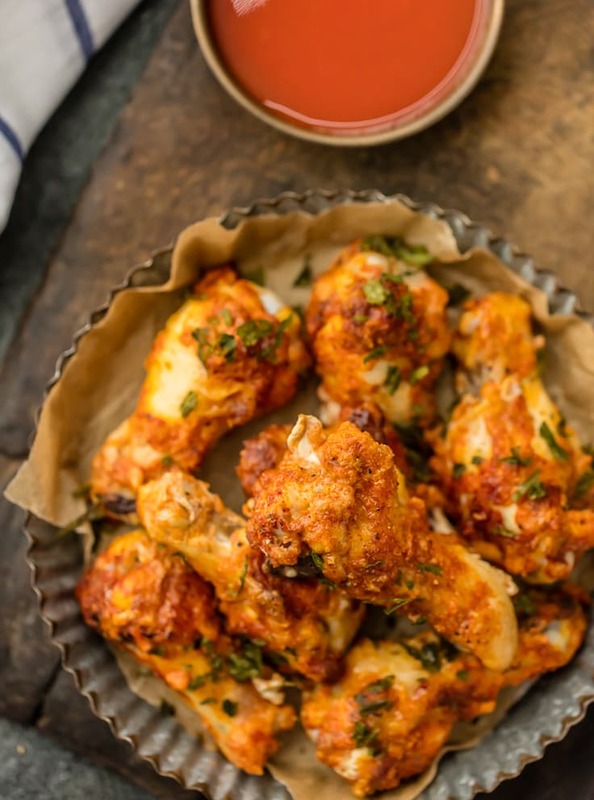 These Easy Baked Chicken Wings will make any wing-loving husband (or wife!) pretty darn happy on Valentine’s Day. You’re welcome, Pat! 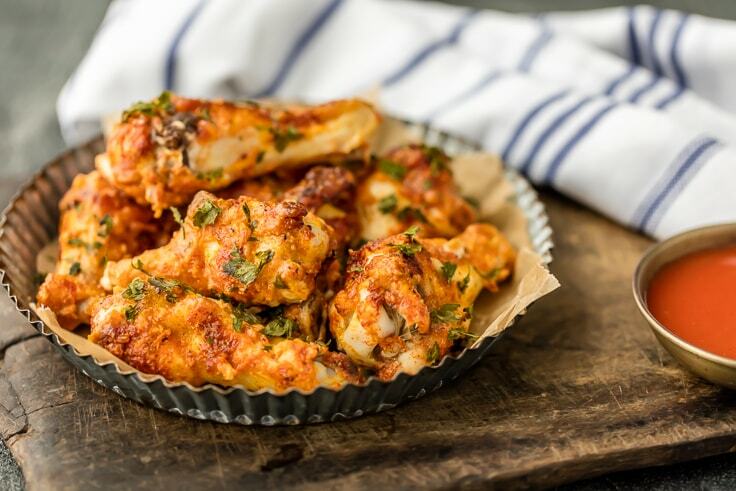 And of course, these baked wings are the perfect appetizer for game day, Super Bowl Sunday, or any occasion. They make great party food! These Oven Baked Chicken Wings are so delicious. 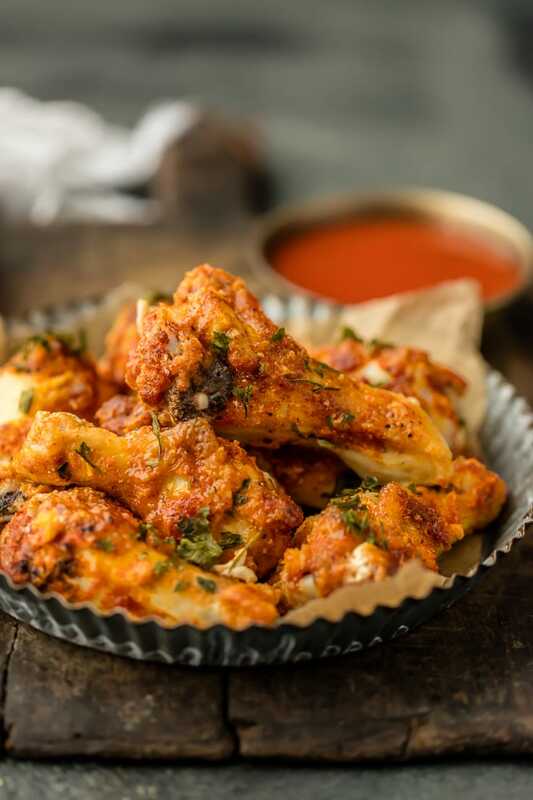 Made with the best Chicken Wing Seasoning, you won’t be able to resists these wings! 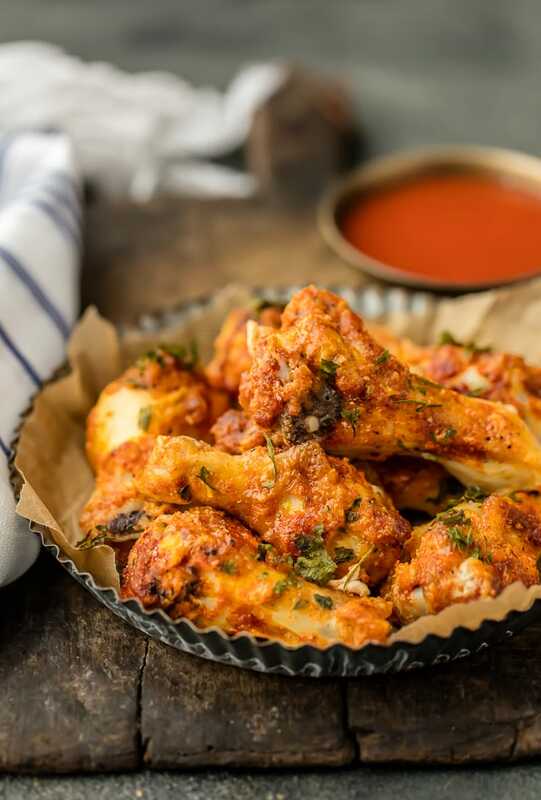 This Simple Spiced Baked Chicken Wings Recipe is a great base that goes with any type of dipping sauce. I usually serve these Baked Chicken Wings with Buffalo Sauce, Ranch, Blue Cheese, and Honey Mustard. I’m the kind of person that likes to have alllll the dipping sauces available when it’s time to eat. Even though I love to dip these Chicken Wings, you don’t need to. The Chicken Wing Seasoning we have used has SO much flavor, and it is so easy. I love the simplicity of the chicken spice rub. The wings get a coating of just flour, paprika, garlic, and salt and pepper. That’s really all they need. They come out of the oven crispy (YES, it’s POSSIBLE! ), delicious, and with just the right amount of spice. The flavor goes well with literally any type of dipping sauce. 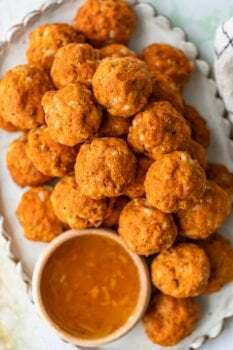 We love them with buffalo sauce, but they would be great with honey mustard, garlic parmesan, or anything else you are partial to! You don’t need to deep fry anything to make wings! That’s what I love about this recipe. Baking chicken wings in the oven is so much easier than frying them, and they are healthier too. This easy baked wings recipe is a lifesaver! Line a baking sheet with foil and dot it with butter. Combine flour, paprika, garlic powder, and salt & pepper in a mixing bowl. Fully coat each wing with the seasoning mix and place it on the baking sheet. Bake chicken wings for 30 minutes at 425°F. Then turn the wings over and bake another 15 minutes. That’s all there is to it! And like I said, that wing seasoning is SO good, these wings come out full of flavor. Just serve with your favorite dips. Sure, desserts are fun on Valentine’s Day. Everybody loves to show their affection with cookies, red velvet cupcakes, and an explosion of pink. 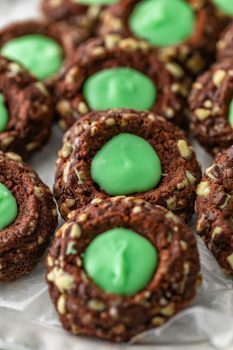 We have you covered for Valentine’s Desserts Recipes, but if you’re favorite person doesn’t have a sweet tooth, you can still show your love through food! If they prefer savory foods, I definitely recommend this Baked Chicken Wings Recipe. Some people, like Pat, prefer Baked Chicken Wings. It’s just a fact of life. I think they might be on to something. He’s a simple guy, and these Simple Baked Wings are right up his alley. We bake our Baked Chicken Wings in a 425° F oven for 30 minutes, turn, and then bake another 10-15 minutes. The chicken wings should have an internal temperature of 190° F.
What if I prefer sticky wings? No problem! 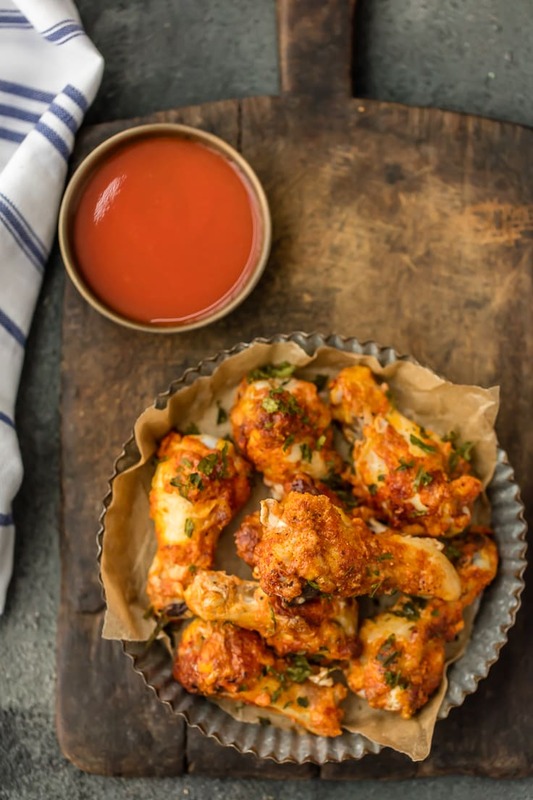 You can simply make an amazing chicken wing sauce such as Buffalo Sauce or Sticky Sesame, and toss the wings fully before serving. Easy! Do you have other favorite Chicken Recipes? OH YES! So many. We have our Buttermilk Fried Chicken, Baked Chicken Tacos, and Creamy Caesar Chicken, just to name a few! You can see all of our Chicken Recipes and pick your favorite for dinner. See below for details on How to Bake Chicken Wings with the Best Wing Seasoning! Enjoy. Be sure to hop over to my friends sites to see these other awesome appetizer recipes! Each has a video, so be sure to tune in!! 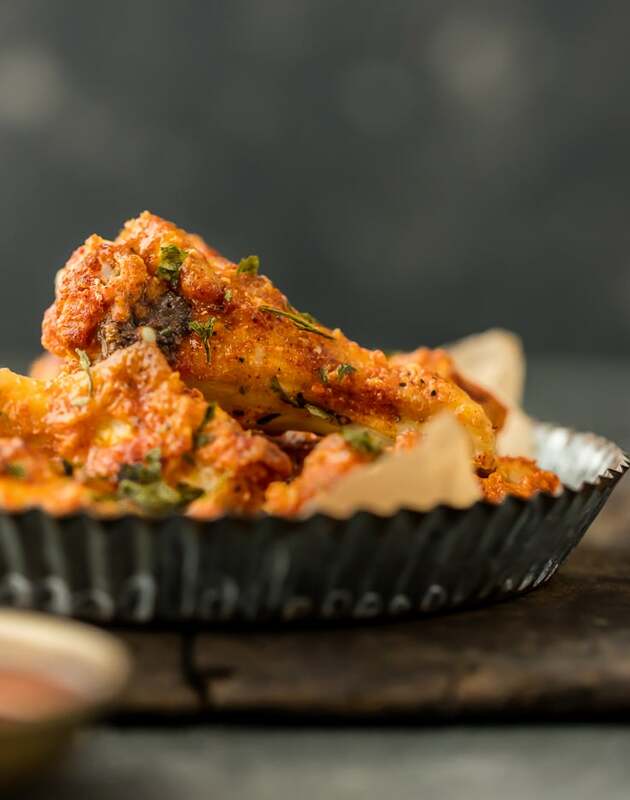 Looking for more wing recipes? We’ve got plenty! Baked Chicken Wings have the most amazing Chicken Wing Seasoning consisting of paprika, garlic, salt and pepper. 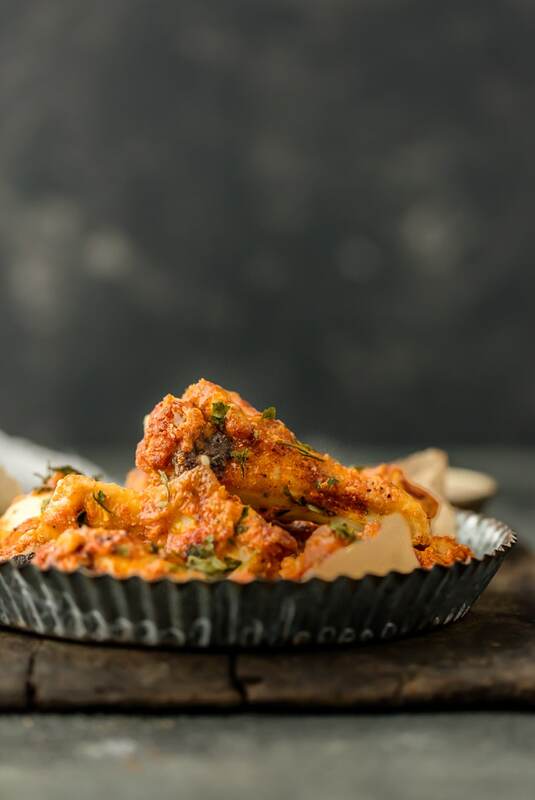 If you've wondered How to Bake Chicken Wings that are crispy, flavorful, and amazing, this recipe is for you! EASY Baked Chicken Wings do exist and they're just as delicious, and definitely healthier, when baked and not fried. This is our very favorite Baked Chicken Wings Recipe! Line a baking sheet with foil. Dot the foil with the butter, there is no need to melt it ahead of time but you can if you would like. In a medium sized bowl, combine flour, paprika, garlic powder, and salt and pepper. Coat both sides of each wing fully in the flour mixture and place on the baking sheet. Make sure the butter pieces are evenly spaced out among the wings. Bake wings for 30 minutes. Turn wings over and bake for an additional 15 more minutes or until crispy and fully cooked. Serve with your favorite dipping sauce and sprinkle with fresh parsley if desired. These look amazing! Pass over the ranch, YUM! These wings look so good. Your food photography is wonderful to see. You can just SEE the flavor on these babies – they look so good! We’re big wings and beer people around here, so I’ll definitely be giving these a try. Becky, love the photos of your wings! Gorgeous and tempting! These photos are amazing! Pretty sure I’d enjoy getting some chicken wings for Valentine’s Day, too! Dip these into some ranch and yum oh so good! You can use a lil cayenne pepper– Thats what I did.